With the Holidays upon us I've been thinking of how I want to decorate my room for Christmas along with purchasing a few decorative items. I came across an account on Etsy that sells pre-made felt flowers which you can use for parties, a flower crown or a wreath. Since I saw the flowers it reminded me how I always wanted a holiday wreath for my house but never seemed to find the perfect one. I thought why not try to make my very own and that's exactly what I did! The first thing you are going to start off by doing is covering your foam ring in yarn. This may take some time depending on the size of the ring, I went with the smallest size Michael's carried. You can do this neatly or messy by overlapping the yarn. I first kept it neat but once I reached the other side I began to overlap the yarn to give it a little more texture. When you're done make sure to tie the yarn tightly so that it doesn't loosen up. Now you are going to cut circles onto your felt. Make sure to do different sized circles so that you can have some smaller and larger flowers. Once you have your circles cut you are going to cut them into a spiral. While doing this you can either cut straight or also cut some curves that are similar to scallops. This will make the flowers look a little more realistic. When you're done cutting your felt grab the center of the spiral felt and start twisting the rest of the felt around it. Here you will also start to hot glue the felt as you go. Be careful! I burned my fingers a lot while doing this. 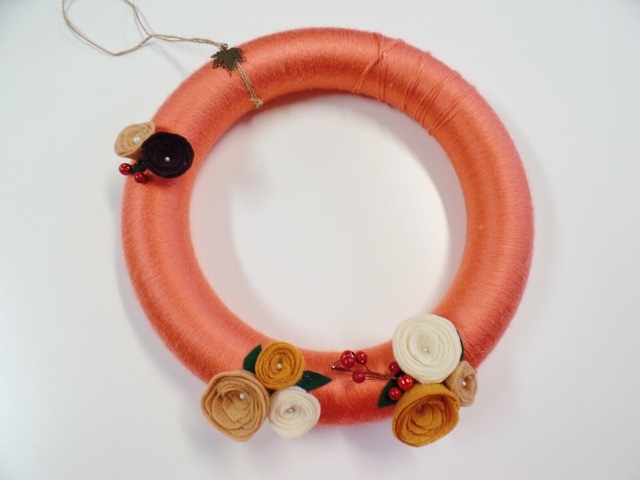 Now is the time to decide where you want your flowers to be placed on your wreath. I didn't end up using half of the flowers I made or all the colors but that's ok it's always better to be safe than sorry. Once you know where you want to place your flowers begin to glue them down along with any other decorative items you may have. At this point you can also cut up some leaves and glue them down. I actually forgot to take photos of mine. This is how mine looked once I was all done glueing my flowers and berries. Next I added some decorative pins to the center of the flowers. 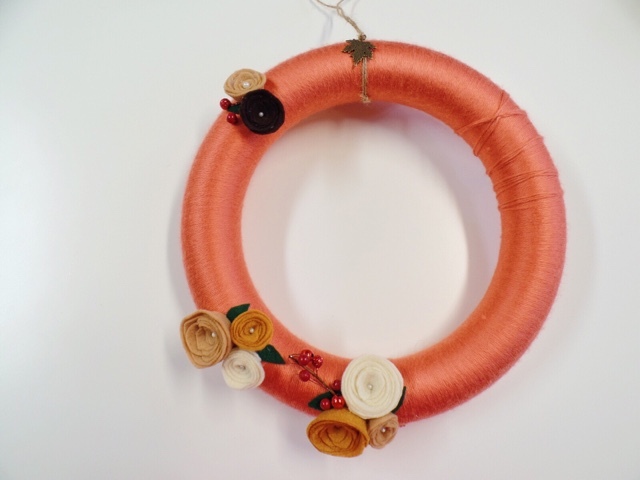 Add a string or ribbon to the top of your wreath so that you can hang it and you're all done! I thought this twine gave my wreath the perfect autumn rustic touch. I'm so happy with the way my wreath turned out I know I wouldn't have found anything like this anywhere. I'm very impressed with myself. If you end up making one please feel free to share some photos with me. I would love to see what you come up with. This is so unique I love it. I will definitely have to give it a try. I love the way it turned out. You should definitely make one its kind of fun too! This turned out sooooo beautiful! I'm really tempted to make my own! I'm excited to see yours with the twine!